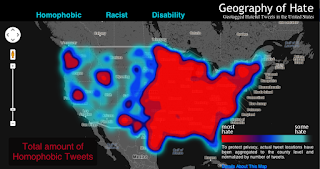 For almost a year now Monica Stephens, an assistant professor at Humboldt State, has been analyzing over 150,000 tweets for words of hate (homophobia, racism, etc.) and plotted them out on an interactive heat map of the US to see where the most hate is being spewed. What do you think? Is the hate concentrated where you expected?